I’m on the road again. As I travelled through Kentucky, and on my way to Memphis, I was reminded of that great Eddie Rabbit song that Elvis had a hit with. I just had to do a backstage rendition. This was done backstage at Bomhard Theater at the Kentucky Center For The Arts. I hope to see ya out on the road someday. I hope. This song was written by Michael Des Barres and Holly Knight. My P3er pal, Michael Des Barres came by the studio and we created a Glammy duet of this Animotion hit. David Dastmalchian helped us out with his glamour. That’s Chuck McCann in the intro and outro. He’s one of my heroes. He is missed. Michael Des Barres and I played guitars. Check out his radio show here. Tim DeLaney played bass, drums, engineered and mixed. Keith Roberts shoots the video! Brought this gem back into my set for my residency at Caesar’s Palace in Las Vegas where every night is Friday night! Here’s a jaunty Christmas time ditty by Louis Prima. I’m often sad but sometimes, especially around the holidays, I get ants in my pants. This song is on my Holiday Jubilee CD. You can get that here. 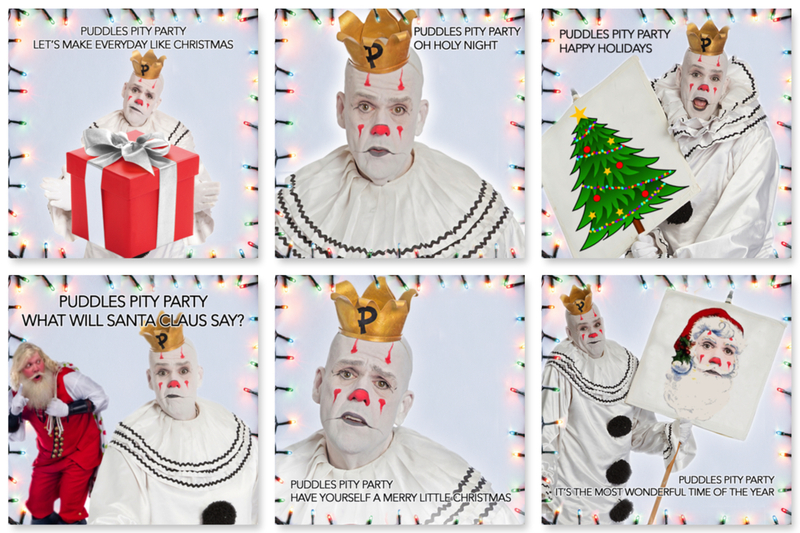 If you’re in Atlanta, please come see my Puddles Pity Party & Friends Holiday Jubilee at The Fox Theatre! I’ll be singing this Christmas beauty at my, first ever, Holiday Jubilee on Dec. 18th at the world famous Fox Theater in Atlanta, GA. Don’t forget to bring an unwrapped toy for Toys For Tots! I hope to see ya there. Get a ticket here. NEW! 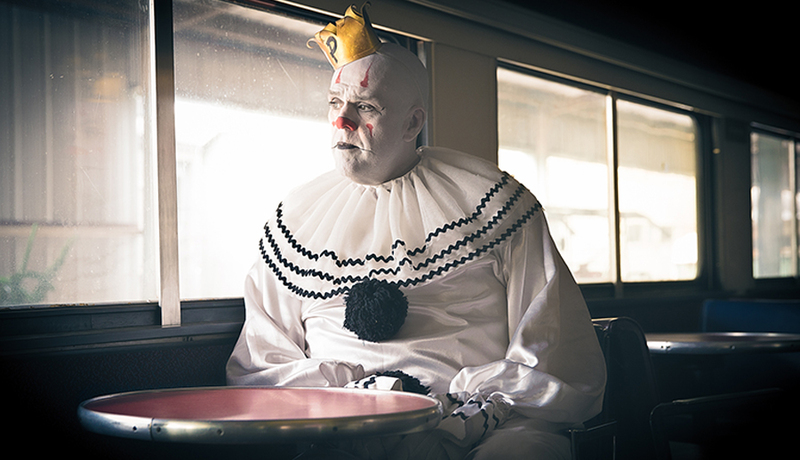 Puddles Pity Party Holiday Jubilee on a CD! Look at what Santa brought! A shiny new CD! Just in time for the holidays! This collection of seasonal classics is sure to warm your cockles and stifle any holiday family argument! Get it here while it’s hot! Many P3ers have been asking if I would make some Holiday music available online. So Tim and I hunkered down in the garage, in between my tour dates, to create some yuletide morsels. I hope you like them. There are some gifted musicians here. Tim DeLaney, Heather Witt, Sam Owens. Jez Graham, Tyrone Thornton, RL Martin. Will Groth, Will Scruggs, Kris Dale, Jeff Calder and Rich Rowlinson. Black Friday Sale through Monday! 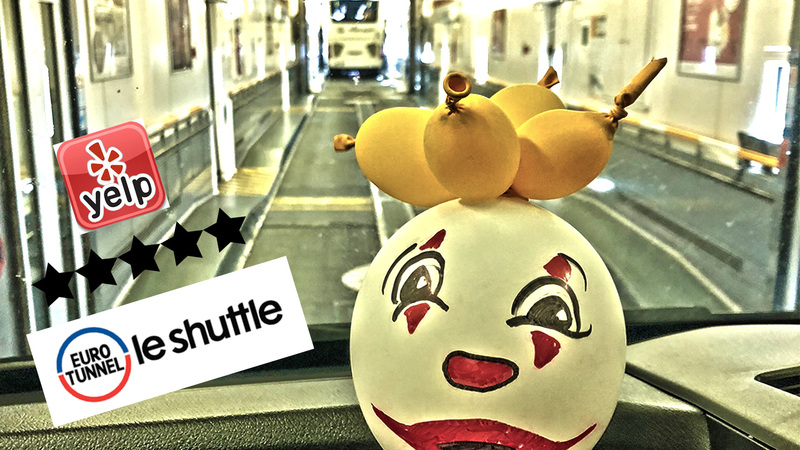 ★★★★★ A wagon in a train in a tunnel under the sea! Imagine a world where we travel in tubes. Well, that IS the world we live in. I was recently on my “Up Close In Your Personage” tour throughout UK, Ireland and EU. So much beauty. We were blessed with good weather. Sunshine days and favorable winds carried us from village to village. Now, I typically prefer a more “olde tymey” mode of transport like walking or bicycle or even the trusty iron horse. But my show dates were many and in a short period of time, therefore I hired a Splitter-style wagon. My production manager, Anthony, was very familiar with this type of vehicle, and he would drive us from place to place. I’ll review that later. We leave London in the morning and drive for a few hours through the gorgeous English countryside. Along M20 we pass towns like Hinxhill, Smeeth, Westenhanger, Peene and Flailing Mouse. That last one I just made up. The rest of them are actual town names. The tension was building as we grew closer to our point of embarkment in Folkstone. Anthony was pedal to the metal. I was chewing my nervous gum with great purpose. Tunnels under the water make me a little anxious. We approach and pass through the check-in gate with the greatest of ease. The attendant was helpful, and he understood Anthony’s Newfoundland English jargon. He cheerfully instructed us to proceed to the Flexiplus queue. There we were, front of the queue. We saw a few shops and restaurants there. I was tempted by their advertisements. “Starbucks. Come in and enjoy your favourite coffee. Open 24 hours.” Or maybe, “Burger King. Eat from the world famous menu.” I chose to stay close to the wagon lest we encounter any unexpected travel weirdness. That’s when it would typically strike. When all is well. As we waited, I began to feel the need to use the facilities. I looked around. Lo and behold, not more than a few meters from us is a facility. I dash across the tarmac and facilitate inside of it. I reorder myself and jet back to the wagon as we are directed onto the next level of our odyssey. My anxiety is waning. We proceed up a long drive of which there are many. Make a right and then another right and down a driveway towards the train. There are articulated lorries (juggernauts, semi-trailers) being loaded into the train. They drive right in! We are directed to proceed to the next train car ahead. Front of the line. I get nervous again. Things are going well. Too well. I’m expecting the travel shoe to drop at anytime. A nice man with an exciting yellow High-Vis jacket motions us into a waiting train car. As we pass, he waves. No smile, just waves. That confuses me. We proceed through car after car until we are directed to stop by a smiling attendant. She smiles and holds up her hand as if to high five us. I return the gesture. Pretty cool. I never space high-fived on a train before. We settle in for our tube journey underneath the English Channel. Is that what they call it on the other end in Calais? Or does it become the French Channel? Anthony mentions that there are facilities a few cars up. I boldly leap from the wagon to explore. The high five has eased my anxiety and caused me to forget I would soon be in a tube under the ocean. These facilities aren’t as spacious as the facilities on the tarmac. This is just one facility. A wee little water closet. But still I manage to facilitate. As I emerged from the WC, two families were standing nearby speaking french. They say “bon jour” to me. I high five them all (with my gloved left hand, of course). They respond with great enthusiasm. We become fast friends (ami). I return to the wagon. As I take my seat, Anthony tells me we’re pulling into Calais. What? I never even felt the thing move. My anxiety was all for naught, and I met new French friends on a train in a tube under the sea. I can’t wait to do to again.